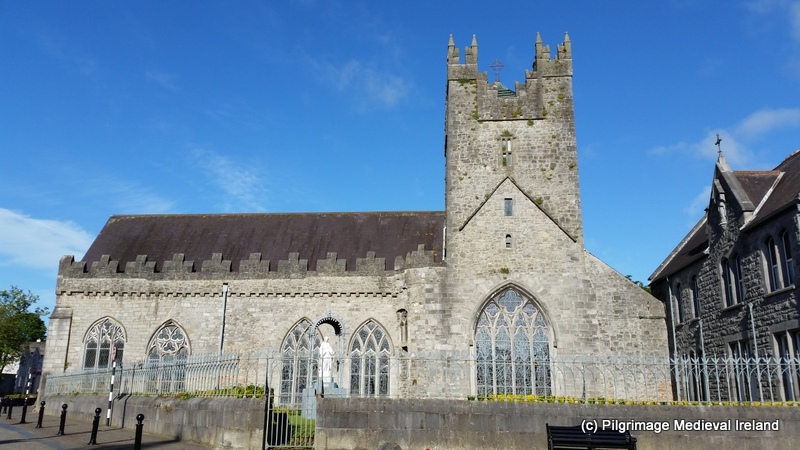 A few weeks back I paid a visit to the wonderful Askeaton Friary in Co Limerick. The friary is located on the banks of the river Deel, at the edge of town just off the N69. 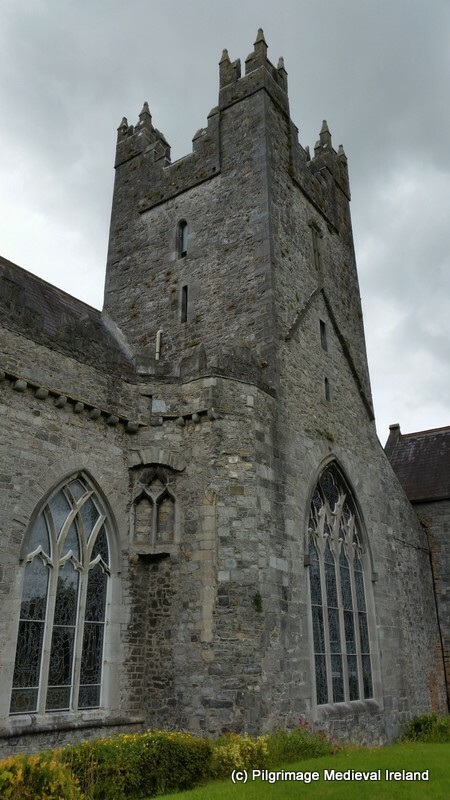 According to the Monastic Ireland website The friary was founded in the year 1389 by either Gerald Fitzgerald the 3rd earl of Desmond and Lord Justice of Ireland, or in 1420 by James Fitzgerald the 7th earl of Desmond. The friary seems to have survived the dissolution and a provincial chapter was held here in 1564. Shortly afterwards during the Desmond Wars the friary was taken over by Nicholas Malby and the friars were expelled. The ruins of the friary are extensive and in a very good state of repair. The ruins date primarily to the fourteenth and fifteenth century and include a cloister, church and domestic buildings. Plan of remains of Askeaton Friary showing building phases. Today the friary is accessed through a modern graveyard on the east side of the monastic remains. Door leading into the cloister in the south wall. To enter the interior of the ruins and the cloister one must pass through a finely fifteenth century pointed doorway in the south wall. This doorway is opposite a spiral staircase that provides acces to the upper story of the east range. Doorway on the east side south wall providing access to the cloister and the east range at Askeaton Friary. As you enter this doorway and turn left you find an extremely well-preserved to the cloister. The cloister consists of a central rectangular area surrounded by a covered walkway. The cloister was the heart of the monastery, a place of quiet contemplation and the means of communication between the monastic church and domestic buildings. 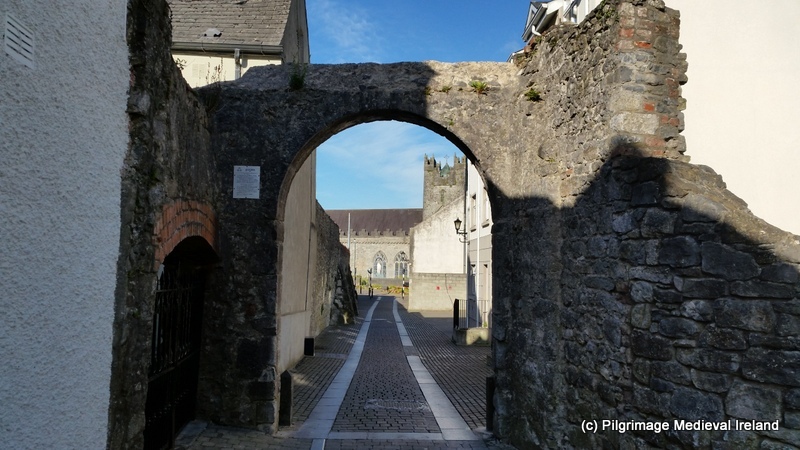 At Askeaton the cloister walkway has very finely carved arches. Each arch is composed of columns with moulded bases and capitals. 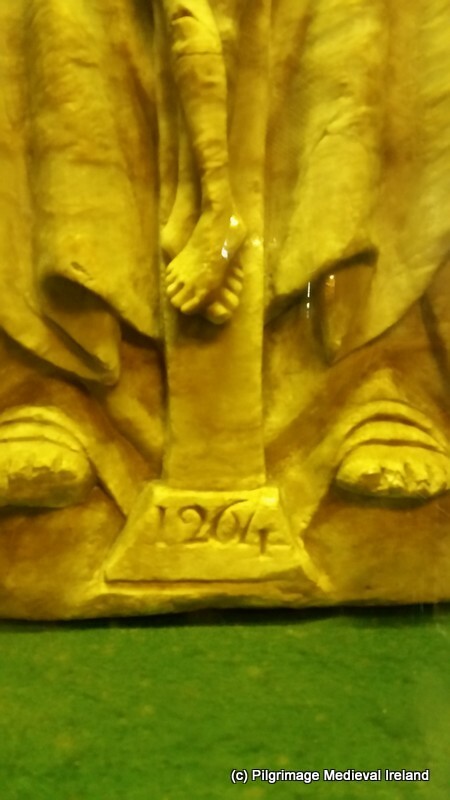 In the northeast corner of the cloister, there is a carving of St Francis the patron saint of the Franciscan order. 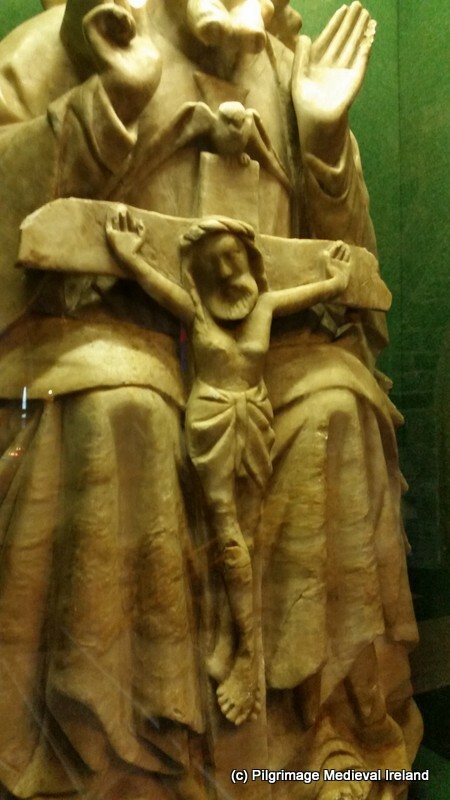 The saint is depicted in monastic robes with stigmata. Carving of St Francis in the northeast corner of the cloister at Askeaton Friary.. The cloister provides access to the church and the domestic buildings through a series of doors. The nave of the church is entered through a lovely pointed doorway with beautiful carvings on the base. Doorway into the nave church at Askeaton Friary. Finely carved decoration at the base of the doorway leading into the church at Askeaton Friary.. Finely carved decoration at the base of the doorway leading into the church at Askeaton Friary. The church is a long building of fourteenth century date with an undivided nave and chancel. View of the nave of the church from south end church at Askeaton Friary. 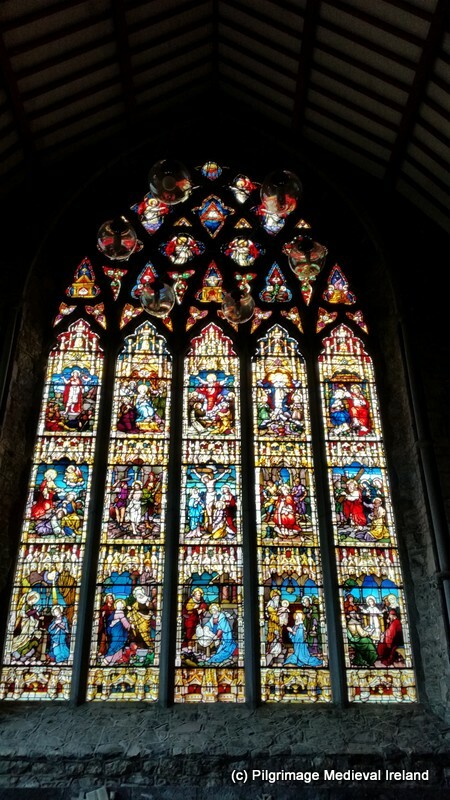 Five light tracery east window at church in Askeaton Friary.. The church has some very interesting features, including a triple sedilia and choir stalls in the east end of the south wall. Triple sedilia and choir stalls in the east wall of the church. Above the sedilia is a large plaque sixteenth century date, contemporary carved stones some and a second plaque (later insertions) and a finely carved tracery window. Carved stones located above triple sedilia at Askeaton Friary. Carving with floral design inserted above sedilia in northeast corner of the churchat Askeaton Friary. The walls of the church still retain a number of hooded tomb niches, three in the south wall and one in the north wall. Tomb niche in south wall of chancel of church , with door leading to cloister at Askeaton Friary. View of two of the tomb niches in the south wall of the friary church at Askeaton. The church also has some very finely carved tracery windows. Window in the southeast corner of church at Askeaton Friary. Carved decoration at base of window in the southeast corner of church at Askeaton Friary. Window in west wall of transepth at Askeaton Friary. Finely carved window in south wall of church at Askeaton Friary. The remains of a later fifteenth century transept are found at the northwest end of the church building. A pointed doorway in the north wall connects the chancel to the sacristy. At the base of the doorways is a spiral carving. I wonder if it is a masons mark. Doorway leading to the sacristry at Askeaton Friary. Tiny carving of a spiral at the base of the doorway leading into sacristry at Askeaton Friary. Remains of barrel vaulted ceiling at Askeaton Friary. View of sacristry at Askeaton Friary. Behind the sacristy is a large green area marked as the ‘old graveyard’ on the 1st edition Ordnance Survey map is located behind the church and sacristy. There are some large chunks of masonry from the transept walls scattered around the graveyard. Chunks of masonry from transept of the church at Askeaton Friary. Green area on the north side of Askeaton Friary. The domestic building of the friary also survive and are found on the east and west side of the clositer. The east range includes the monastic kitchen. It is a two stories and the ground floor is roofed with a long barrel-vaulted ceiling. A finely carved fireplace is located towards the north end of the east wall. Ground floor of east range at Askeaton Friary. Large finely carved fireplace in the east wall of east range at Askeaton Friary..
Possible oven in the east range of Askeaton Friary. Chimmney flue in east range at Askeaton Friary. The refectory or dining room,juts out of the southeast corner of the cloister. It is two stories in height and dates to circa fifteenth century. Interior of refectory at Akeaton Friary. The chapter room where monks conducted business also survives and is in good condition. It was locked when I visited so I could only peek in through the metal gate. with in the area are the tombs of the martyrs Bishop Patrick O’Healy and Fr Conn O’Rourke. A very fragmentary painting survives in the upper floor of the domestic ranges – a space that would have been reserved for the friars. 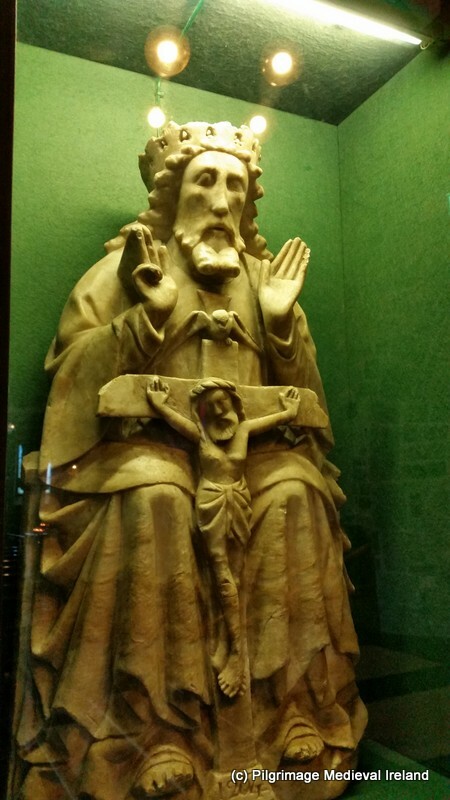 It depicts a devotional image of the ‘Man of Sorrows’- showing Christ surrounded by the instruments of his Passion (http://www.monastic.ie/tour/askeaton-franciscan-friary/). Exterior wall of west gable of the church and chapter house at Askeaton friary. View of River Deel at Askeaton Friary. For a more in-depth discussion of the site check out the wonderful Monastic Ireland website.